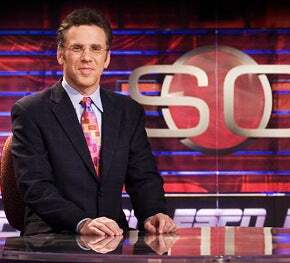 An occasional feature in which we explain and evaluate a SportsCenter anchor's pet phrase. Today's phrase: "Mahatma ... Gandhi." Context: Rockies outfielder Ryan Spilborghs hits a grand slam in the bottom of the 14th inning to give Colorado a 6-4 victory over the Giants. Origin: Mahatma Gandhi was, of course, the renowned prophet of nonviolence and Indian independence who died by an assassin's bullet in 1948, whereupon, one correspondent wrote, "humanity wept." His given name was Mohandas, but he was known around the world by the honorific "Mahatma," which combines the Sanskrit words "maha" (great) and "atma" (soul). There is some dispute about who first bestowed the title, but it is said that in 1915, at a Jetpur city meeting, a supporter read aloud a commendation in which he addressed Gandhi as "Shriman Mahatma Mohandas Karmchand Gandhi" and then declared, "It is not an exaggeration to honor you with the title of 'Mahan Yogi,' it is based upon your self-knowledge of the Mahan soul." The surname, Gandhi, is an occupational name that means "perfume seller." The first syllable sounds like "gone," a word often used by SportsCenter anchors to characterize a home run, thus providing Everett with his pun. In its delivery, the phrase may recall Everett's "Bartender ... Jack," a sort of drunk uncle to "Mahatma ... Gandhi." In an e-mail, the anchor explains: "Gandhi was two kids from Kansas City emailing me one night...they liked 'bartender' and thought Gandhi would kill..."
Analysis: The call comes from a rich and rarely tapped vein of SportsCenter Dadaist phrasemaking, which, in another era, gave us "... with Port authority" and "... with Brad Daugherty," both of them riffs on the hugely clichéd "... with authority." The literal-minded may complain that the phrase cheapens the memory of a great leader, but they miss the irony here. This one floats above all the common Bermanisms, operating simultaneously as a reference and a rebuke to their soft-headed foolishness. "Mahatma ... Gandhi" is the reductio ad absurdum of catchphrases, and whenever it's spoken, it's a wink to the audience, as if Everett were informing us that the whole catchphrase pursuit had at last consumed all of its mass and collapsed in on itself, like a dying star. Humanity does not weep. Aptness (out of 5): Technically zero, but the inaptness is its very point. This will be scored a 5.